Anderson Breazeale’s attention to detail was rewarded on Friday. The Breck/Blake senior was a part of two Class 1A state records at the boys’ swimming and diving preliminaries at the Jean K. Freeman Aquatic Center. Breazeale set a record in the 100-yard backstroke (48.57 seconds) as he goes for his second consecutive title in that event. He also teamed with James Pan, Spencer Pruett and Dylan Brown to set a record of 1:32.43 in 200 medley relay as Breck/Blake got off to a good start in its bid for a third consecutive state title. 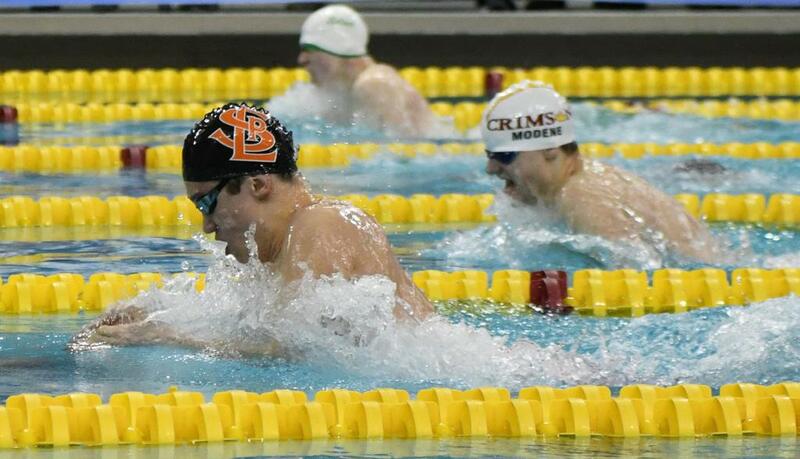 Breazeale also had the top qualifying time in the 50 freestyle (20.96) and closed out his day by teaming with Brown, Pruett and Luke Hamlin for the top qualifying time in the 400 freestyle relay. Breazeale didn’t compete in the 50 freestyle at last year’s state meet. He finished second in the 200 individual medley last year. Breazeale’s twin brother, Thayer, had the top qualifying time in the 200 freestyle and second-best qualifying time in the 100 butterfly. Minnehaha Academy junior Andrew Karpenko set a Class 1A record in the 200 individual medley with a time of 1:49.02. Karpenko, the defending state champion in the 200 IM, also set a state meet record in the 100 breaststroke. His time of 54:49 seconds broke the record of 54.75 set by Breck/Blake’s Humphrey Pruett in 2015. Edina senior Peter Larson and Lakeville North senior Andrew Trepanier put on a dazzling display in the Class 2A preliminaries. In the 50 freestyle, Trepanier won his heat in a state meet record of 20.12. Moments later, in the next heat, Larson bettered that with a 19.97. Trepanier, who also won the 100 freestyle at last year’s meet, also had the top qualifying time in the 100 butterfly, at 48.49 seconds. The state meet record in the event is 48.20. Larson also broke the state record in the 100 freestyle, finishing in 43.46. Despite having its 200 medley relay disqualified, Edina had a strong showing in the preliminaries in its bid for its first Class 2A state title since 2010. In addition to Larson’s record-breaking performances, senior Andrew Gray had the top qualifying time in the 200 freestyle (1:38.69) and the second-best qualifying time in the 100 butterfly (48.78). At last year’s state meet, Gray was third in the 200 freestyle and third in the 500 freestyle. Larson also teamed with Jacob Biscan, Max Dow and Charlie Webb for the top qualifying time (1:24.32) in the 200 freestyle relay. Gray teamed with with Webb, Liam DeMuth and Keegan Duffy for the second-best time (3:06.68) in the 400 free relay. Chanhassen/Chaska had the top time (3:06.61. St. Louis Park sophomore Hayden Zheng had the top qualifying times in the Class 2A 200 individual medley (1:49.42) and 100 breaststroke (55.27). Zheng won the state title in the 100 breaststroke last year, in 56.43. He finished third in the 200 IM with a time of 1:50.57. In the diving preliminaries on Thursday, Stillwater junior Josiah Fick had the top score in Class 2A with a 276.95. St. Michael-Albertville sophomore Tyler Barrett was second with 269.05. In Class 1A, Sauk Rapids-Rice sophomore Elijah Grabinski had the top score with a 276.15. Spencer Fritze of Park Rapids had a 272.85, and defending state champion Jack Grabinski of Sauk Rapids-Rice was third at 269.10.